Orenchi seems to get shorter and shorter with each passing episode. 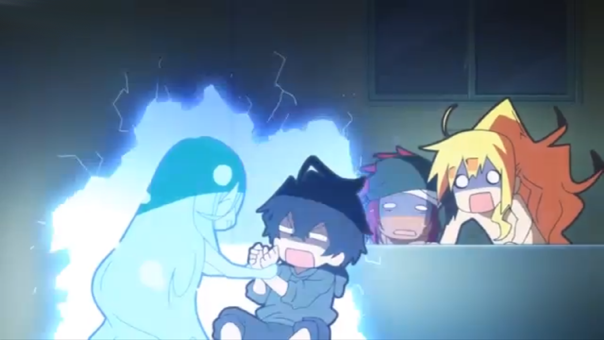 This week, we meet Mikuni, a jellyfish boy who Tatsumi worried was a ghost. Anyway. 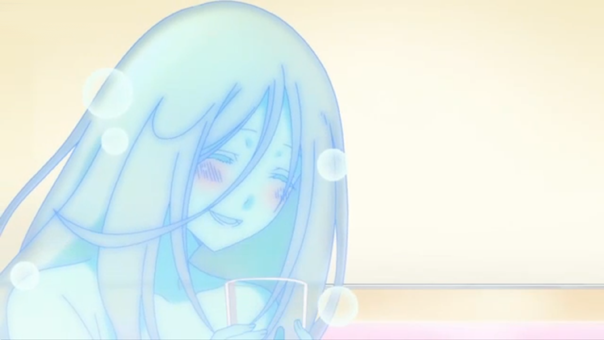 Mikuni is a very nice fellow/BL character and he is want for nothing more than some water. In fact, he’s so ecological, all he can think of as a special treat from Tatsumi is fresh bottled water. Tatsumi is very taken with him and very very happy to get him that bottled water and… this is getting pretty BL at this point isn’t it? Thankfully, Orenchi no Furo Jijou doesn’t seem interested in making its BL aspect especially physical, which is probably for the best. It’s goofy enough — awkward enough — as it is. I’m not sure there were any jokes this week, which… uh… uh… I don’t know what to make of, really? There isn’t much to this show and calling it harmless over and over is an awful strange thing to say as a critical response. Why am I still watching this? Somebody? Anybody? ?